Do you love fresh tomatoes, peppers, and herbs? Me too! Growing your own is so simple. Years ago, I had only a small plot of ground within a patio in a condo I lived in. It got some sun, but not a lot. Still, when I added some containers, I was able to easily grow all of the items I mentioned. A few years ago, my husband and I bought a larger home with a good bit of space, but I still didn’t have room for a large garden. We had a space that was covered with overgrown holly bushes and I hated them, so my husband hooked a big chain to them a pulled them out with a winch on the front of his jeep — yea, we’re a little redneck sometimes. 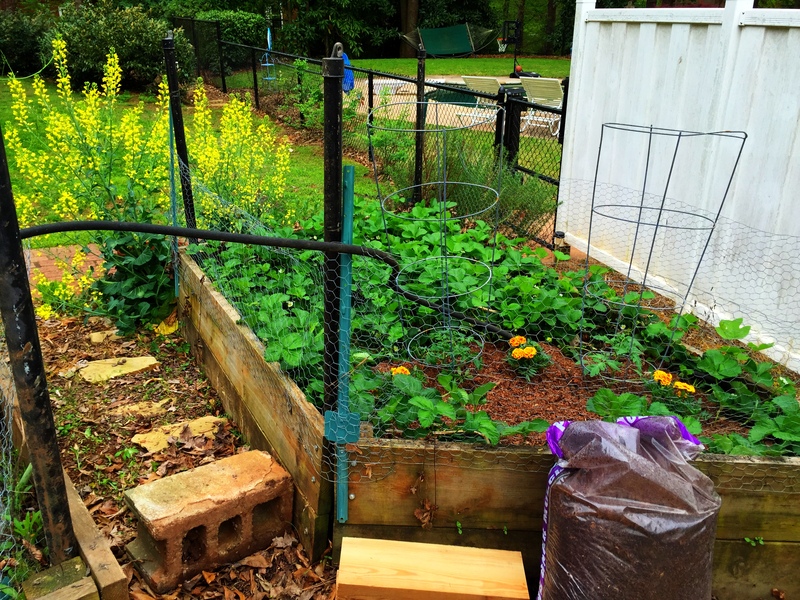 In their place, he built me some beautiful raised beds, about 10 ft x 10 ft and about 18″ high. They’re awesome! Last year, I had an infant and not enough energy to make the garden work for me and I let it go to pot. 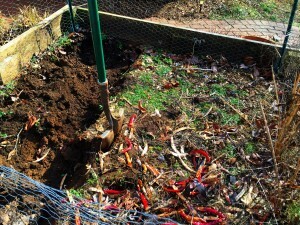 The bed before I cleaned it out – lots of leftover pepper pods and weeds. 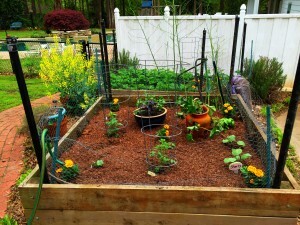 Last week, we were on vacation and my hubs and I did a full renovation to the garden. 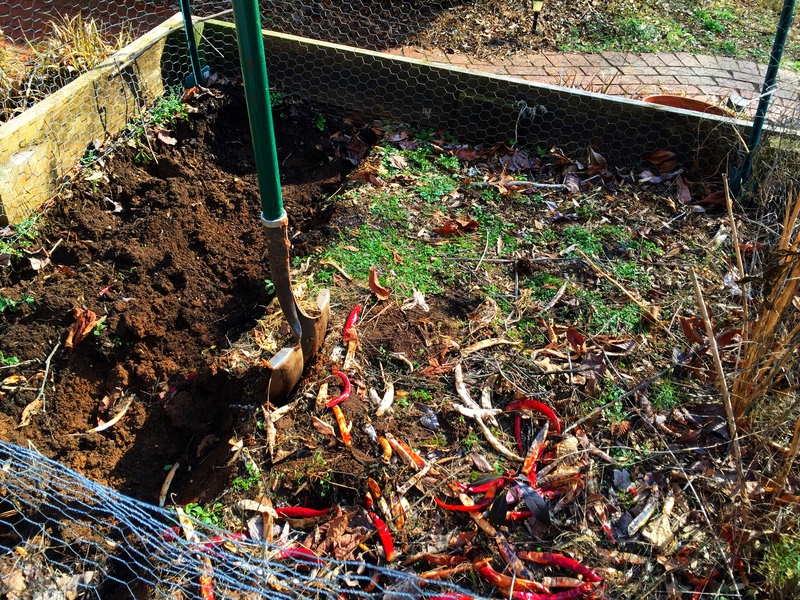 Since I’d been planting some of the same things for a couple of years, I’d gotten a bit of blight on my last tomatoes and received a recommendation from a farmer I know to remove much of the dirt in the beds and replace with new rich dirt mixed with compost. Which is exactly what we did, right before I planted new beautiful plants! Four tomato plants, a jalapeno and a salsa pepper, two Japanese eggplants, basil, cilantro, parsley, mint and purple basil. One of my beds was full of strawberry plants, which provided an abundance of berries last year with absolutely no work from me at all. I couldn’t bear to pull them all up, but they’d taken over the entire bed. So I cleared out space enough for two of my tomato plants and I’ll have to manage the strawberries. One thing to know about strawberry plants is that they can be super hard to control. They spread like weeds, so keep them in a space where they can be controlled. This year, I’ll have tons of fresh, juicy tomatoes and herbs for very little input and effort. Are you a gardener? What are you growing?